Developing countries in their bid to raise the standards of living of their people through development plans have often found themselves in the grip of inflation. demand. This is the case of developed economies. In advanced countries, during dcpre . ion, there is a lot of excess capacity in the system so that an increase in output presents no difficult problems. 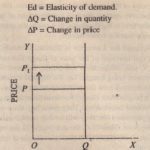 Thus, when the supply of output can e increased easily so as to match increase in effective demand, there need be no inflationary pressures. The situation in under-developed countries is, however. different. Here an increase in investment does create additional demand but a corresponding increase in the supply of output cannot be taken for granted .Unemployment in under-developed economics is not due to t e lack of effective demand hut due to the dearth of real capital. In these countries, level of national income can be increased and the unemployment can be removed by accumulating more real capital. But increase in the rate of capital formation requires stepping up the level f of investment. Now, under-developed countries, under their devcl osment plans, arc making huge investment expenditure to increase the rate of capital formation and thus to obtain rapid economic growth. This huge inv:stment expenditure leads to a sharp increase.